Child Abuse Prevention Month: Who Should You Contact? Monday is the deadline to register to vote in the May 15 primary election. 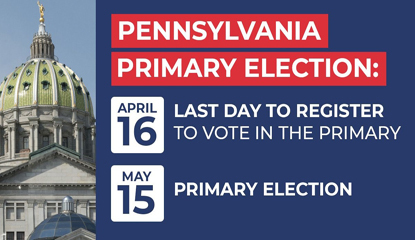 Eligible voters can register online, by mail or apply in person at a county voter registration office, PennDOT and several other government offices. Primary voters who are registered as Republican or Democrat will choose the two parties’ nominees for U.S. senator, governor, lieutenant governor, representatives in Congress, half of state senators, all representatives in the General Assembly and members of the state and county party committees. April is Child Abuse Prevention Month, an opportunity to become familiar with available resources. If you suspect child abuse or neglect, call the PA ChildLine at 1-800-932-0313. If you are not reporting a new case of child abuse/neglect, but need related assistance, useful contact information is available, including general questions related to mandated reporting or certifications, ChildLine and Abuse Registry Appeals, how to sign up for online training on recognizing and reporting child abuse, and more. Eligible veterans who served on active duty in the Persian Gulf Theater of Operations from Aug. 2, 1990 to Aug. 31, 1991 have until Aug. 31, 2018 to collect a special one-time payment to honor their service and sacrifice. The bonus program is administered by the Pennsylvania Department of Military and Veterans Affairs and pays $75 per month for qualifying, active-duty service members, up to a $525 maximum. For personnel whose death was related to illness or injury received in the line of duty in Operations Desert Shield or Desert Storm, there is an additional $5,000 available to the surviving family. Service members who were declared prisoners of war may also be eligible for an additional $5,000. Now that winter is behind us, you can plan a Pennsylvania vacation with the 2018 Happy Traveler Guide. Find urban attractions, outdoor adventures, festivals, road trips, plus coupons to save money. Many attractions highlight our rich history and are kid-friendly. Tourism is great for our region and Pennsylvania. Travelers contributed nearly $4.4 billion in state and local tax revenue and $4.5 billion in federal taxes in 2015. I am officially introducing my bill to eliminate school property taxes on owner-occupied homes the week of April 16. 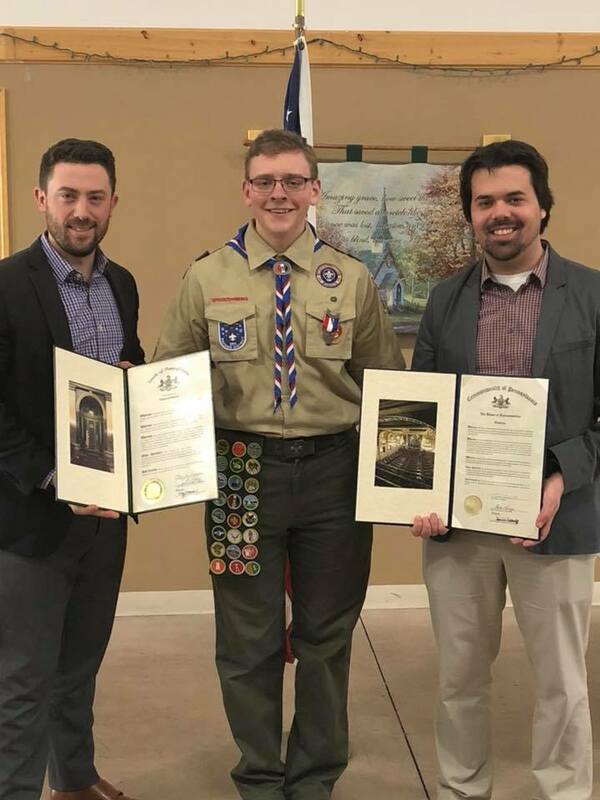 Congratulations to Nick Govus of Troop 85 in Tannersville on earning the rank of Eagle Scout. For his service project, Nick designed and constructed a 75-foot slate pathway and an 18-by-21 foot shadow box fence for St. Paul’s Lutheran Church in East Stroudsburg. The project took 258 service hours to complete. Great job on this outstanding achievement, Nick, and we wish you all the best as you go on to college. 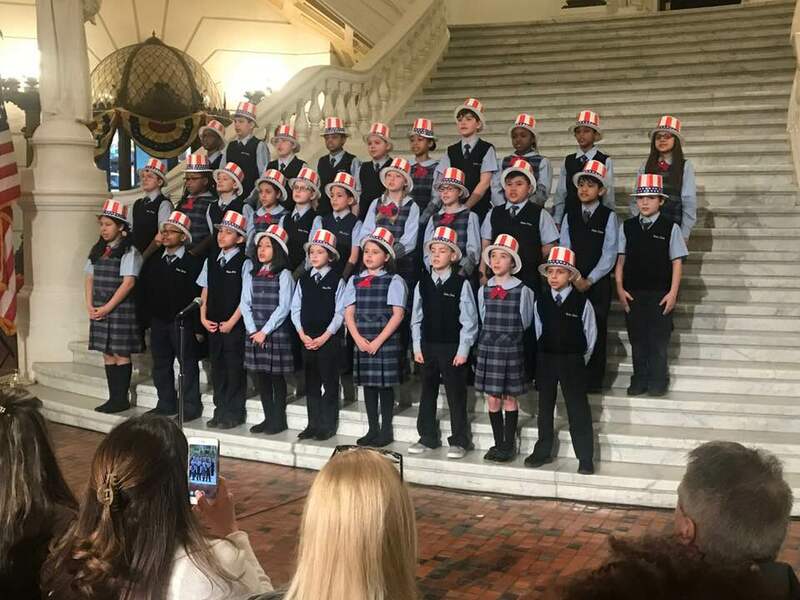 The fourth grade class from Notre Dame Elementary in East Stroudsburg recently performed a set of patriotic songs in the rotunda of the Capitol Building in Harrisburg. This has become an annual tradition and it is a pleasure to hear their voices fill the halls of the Capitol. Thank you for making the trip down and for representing Notre Dame so well!